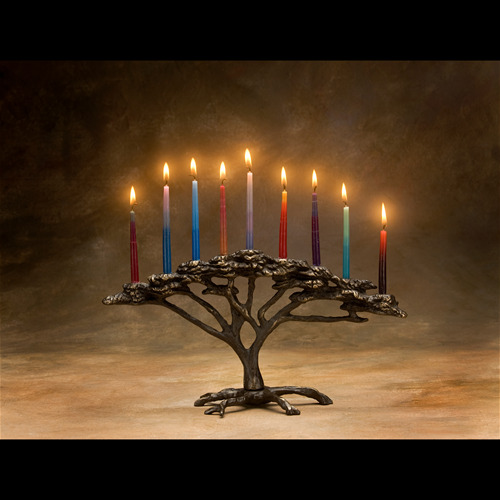 For over four decades, Scott Nelles has been producing cast bronze sculpture and decorative items. From toys to candlesticks, his work displays a childlike playfulness, elegant design and superb control of his medium. In his foundry and studio in northern Michigan, Nelles is inspired by the natural world and the creatures within it. 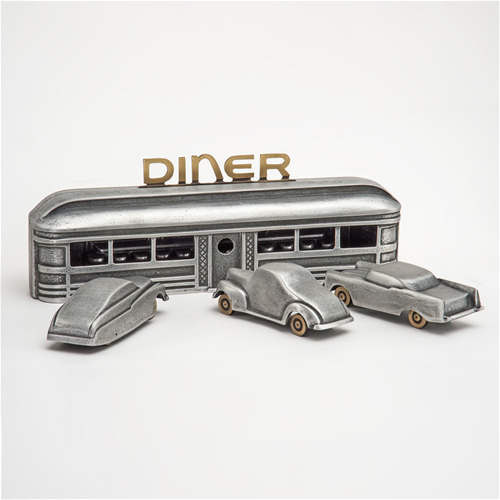 HAND CAST BRONZE & ALUMINUM My vintage diner is reminiscent of "happy days" gone by! Think burgers, fries, milkshakes and car hops. Attention to detail inside includes malt machines, full counter and stools. Don't forget to look around back to see the local stray dog helping himself to the leftovers. Dogs gotta eat too! Add in the separate cars for more retro fun. The 1957 Chevrolet is a classic muscle car, also known as the 57 Shaker. The 1940 Ford Coup has been stylized by many into a classic hot rod conversion. The 1949 Mercury also known as the "lead sled" because so much lead was used in the early days to customize the body of this car. DINER: H - 5.5", W - 3", L - 16", 5 lbs. CARS: (EACH) H - 2", W - 2", L - 6", 11oz. HAND CAST in BRONZE & ALUMINUM. 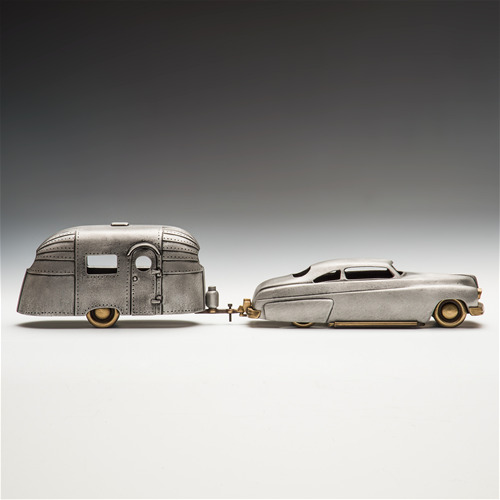 Pack up the family and chart your course in my 49 Merc and Aero Stream Trailer! The Aero Stream has a fully functional door and a hitch to connect it to the '49 Merc. A classic among classics, this duo will quickly become a favorite among classic campers, hot-rodders and car buffs alike. H- 6.5", W - 6.5", L - 32", 13 lbs. 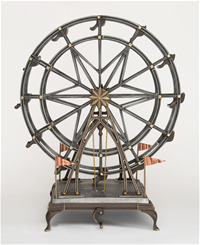 HAND CAST in BRONZE & ALUMINUM In 1893 George W. G. Ferris Jr., a Pittsburgh bridge engineer, designed and built a giant amusement wheel at the Worlds Colombian Exposition in Chicago. 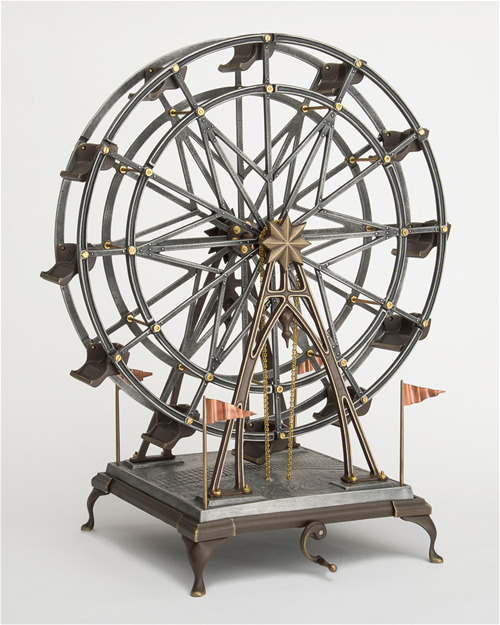 His was the largest and most successful wheel of the time and carried 38,000 people per day while the fair was open. Who among us has never experienced riding on a Ferris wheel? Thrill seekers and lovers young and old have memories of riding a Ferris wheel. Engineering has always fascinated me and especially big bridges, buildings, towers and the Ferris wheel. Though I never had the math acumen to be an engineer, I can build my own miniature structures and pretend that I am creating something of lasting social value. Made in Aluminum and Bronze my wheel takes almost twenty separate one-hundred pound sand molds just to cast the parts. Dozens of tedious hours and many different operations follow to hand-finish and assemble one of my wheels. I have made a small hand-crank that, when turned, rotates the wheel using sprockets and ladder chain. The seats ride level at all times so as not to spill any passengers. H -28", W - 6.5", D - 15", 30 lbs. 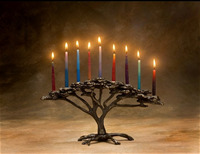 Inspired by the African Acacia, my cast bronze menorah holds nine Hanukkah candles. H - 7.25”, L- 13.25”, 4 lbs. 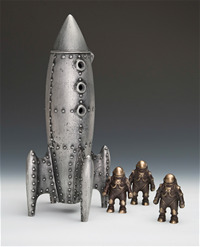 CAST BRONZE & ALUMINUM - For all you space travelers ... this is a great addition to your fleet! 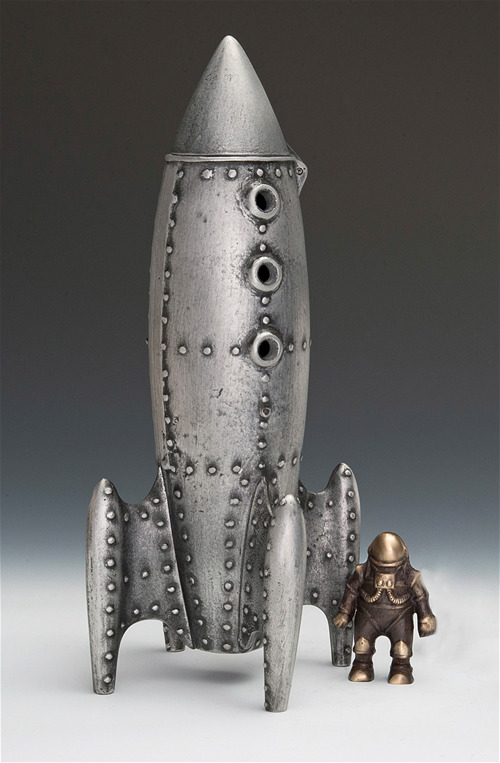 CAST BRONZE & ALUMINUM - We had a different idea of what a moon rocket should look like in 1950. My version is cast in aluminum & bronze. The nosecone folds back to reveal one little bronze spaceman who's included to go along for the ride. He lifts right out to be played with and also reveals a coin slot where you can put your savings toward buying another Nelles original. H - 14", W - 6" , 5 lbs.